I know I said that I'd have lots of time to write about astronomy over the holidays, but really, I got so caught up in watching Farscape, reading webcomics and practising extreme relaxation, that I totally forgot. And then the semester started again and I got busy. Why am I writing right now? Well, my friend, it has to do with that procrastination/amount of work to do correlation. We shouldn't, however, start packing our bags to go visit this extrasolar planet. Besides the fact that interstellar travel is currently just a pipe dream, Gliese 581 g probably wouldn't be as hospitable as one might first think. Even though it's considerably closer to its sun than the Earth is to our own sun, Gliese 581 is much less massive than the Sun and therefore much less luminous. Thus, the average temperature on this planet is about 37 degrees (Celsius) colder than on Earth. It's possible that since it's 3 to 4 times as massive as the Earth, it would be able to sustain a thicker atmosphere with an increased greenhouse effect, but that's pure speculation at this point. I don't know how much that really helped, but the point is, if there is a large difference in temperatures on the planet, it would be more difficult for liquid water to form, and therefore for life to exist. This problem might be solved if the atmosphere of this planet is thick enough to distribute the heat around the planet. Venus, for example, is also almost tidally locked to the Sun and because of its thick atmosphere, the temperature is more or less uniform on all sides. However, since our instruments still aren't good enough to be able to detect the atmospheric composition of Gliese 581 g, it's hard to say anything more on this subject. 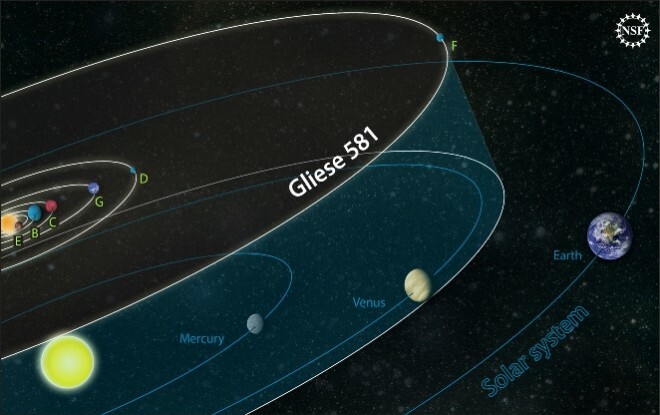 So this other group added 60 data points onto the HARPS measurements and says that they can't find the signal for Gliese 581 g. It has something to do with the error bars on the previous measurements, and assumptions that are made about the shape of the orbits of the planets in the system. On one side of the argument, you have astronomers saying that this new planet doesn't exist at all, and on the other side, the astronomers who originally detected it maintain that you need the data sets from both instruments to be able to see it. At any rate, it will be interesting to see how the argument is settled, which I suppose will happen in the next year or so when even more measurements are taken. If this planet does indeed exist, it's certainly an exciting prospect for discovering life elsewhere in the universe!